This is a series of English translation of the Yogacara bhumi* sastra. Also known as the 17 foundations commentary, it describes the path from an unenlightened worldling to that of an enlightened one, covering the Samadhi foundation, Practice foundation, Sravaka foundation, Paccekabuddha path and Bodhisattva foundation. Translation finally began in mid September 2009 after much procrastination. There are currently two of us, Cheng Soon (formerly Shi RuQing) & me (Shi ChuanGuan). This translation work is started as an attempt to share the yogacara bumi sastra with the English speaking community and perhaps also to stir up interest among the Chinese speaking community. In the first session, we briefly discussed the approaches we could possibly undertake for the translation, whether to do a literal translation or to do a standard translation, which would capture what we think is the intended meaning of the sentence or paragraph and not provide a word for word translation. We decided to adopt the former and when in need, give meaning in footnote when it is ambiguous. As I review the translated text from the first few sessions, it appears that we may be adopting a hybrid approach than a strict literal translation approach. Of the Foundations (some translate as stages), we decided to start with the Foundation of Actualization of Cultivation 修所成地. This is the “Twelfth” in the Seventeen Foundations in the Primary Foundation 本地分中 第十二. This is like a summary of the next foundation, the Foundation of the Sravaka, and is part of the three part practice of Hearing, Contemplation and Cultivation 聞思修. We chose to start our translation with this chapter, in the hope that it would give the practising reader something that can be used immediately. This is not to imply that the earlier chapters are non-essential, but that we hope the reader (and perhaps more importantly ourselves) do not get disheartened with the massive initial chapters. In due time, when we have sufficiently covered a few foundations, we would begin translation of the the earlier chapters. This is a translation work in progress and being our first formal attempt, we hope to hear from others your comments on our approach and translated text so that we can improve on it. Much of the translation are based on the teachings given by our late teacher Master Miu King 妙境老和尚, to whom we are deeply indepted. Needless to say, we have also relied heavily on the English translation of the Nikayas in the Pali Canon for insight into some of the meanings or renderings. We have also referred to the English translation of the Visuddhi-magga on occassion for guide on translation style and depended much on numerous Buddhist dictionaries and reference text for guide on technical renderings of Buddhist terms. For the most part, the primitive and crude translation you will find here is due to our inexperience in translation work. We hope the translation will serve you as much as it has helped us in understanding the commentary yogacara bumi sastra. my teacher Venerable Kwang Sheng for the place we use during our translation from July 2013 onwards. Also to Bhante B. Dhammaratana and The Buddhist Library for the place when we began translation in 2009, without which it would not have even started. May all who read the translation be inspired to learn and practise accordingly and attain to Final Liberation, Nirvana! It has been sent to 佛陀教育基金會 The Corporate Body of the Buddha Educational Foundation, Taiwan, and will be available in due time. Copyright Provenance: © 2012 Shi Chuan Guan and Lee Cheng Soon. (3) you include the full text of this license in any copies or derivatives of this work. Otherwise, all rights reserved. 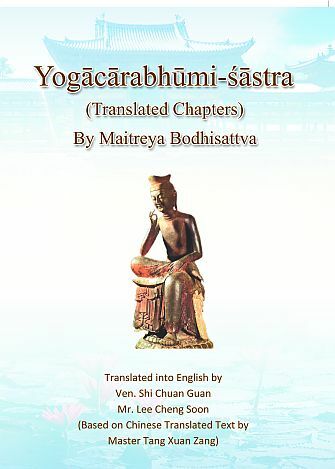 “Selected Translations of Yogācārabhūmi-śāstra” (YC 1), translated from Chinese by Shi Chuan Guan and Lee Cheng Soon. Ramblings of a Monk, http://buddhavacana.net/yogacarabhumi- sastra/. Retrieved on 5 May 2012. This translation is strictly for my personal reference and usage and is not ready or meant for public consumption. It is a work in progress and goes according to the sections that I’m currently learning. I will also focus more on the Samadhi, Practice and Sravaka foundations and proceed to the others only at the later stages. If you have additional information you would like to share, feel free to email me or leave a comments. Note that submitting comments do not guarantee admission, but once submitted, the comments are donated to Public Domain. This means that others can copy and reuse whatever comments you post here and derive further works or learnings from it without restrictions. They are not however, allowed to pass it off as their own and should credit you accordingly. Granted, this is kind of tricky, since our learnings in Buddhism are all derived from the Buddha right? Anyway, let me know ya? And if there are sections that you wish to explore or hope to see translated earlier, let me know as well. may we attain Final Liberation in this life! Note: * Some translations uses bumi instead. Either cases mean “earth, ground or foundation”.